Some fun news, I've starting writing a regular column for the new Italian embroidery magazine Giuliana Ricama that I told you about here. They have graciously permitted me to print an English translation of my column here on my blog when each issue that it appears in has come out. So, if you're in Italy and you'd like to read the article in Italian, you'll have to contact the magazine, but for those English speakers, it is below. Please note that the photos of the actual embroidery did not appear in the magazine due to technical issues and the photo of the original etching print does not appear here on my blog because the magazine purchased permission to use it and my blog did not. One more thing: the photos of this embroidery were sent to me by a lady who contacted me trying to find out something about the piece that she had found at an antiques shop in the U.S. The photos are hers and are used here with permission. 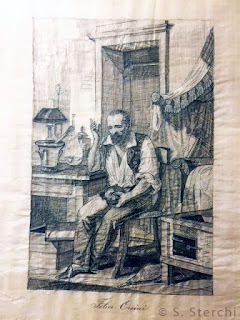 Printwork Embroidery is a technique of embroidery that imitates engraving artwork prints and was very popular in the first half of the 1800s. 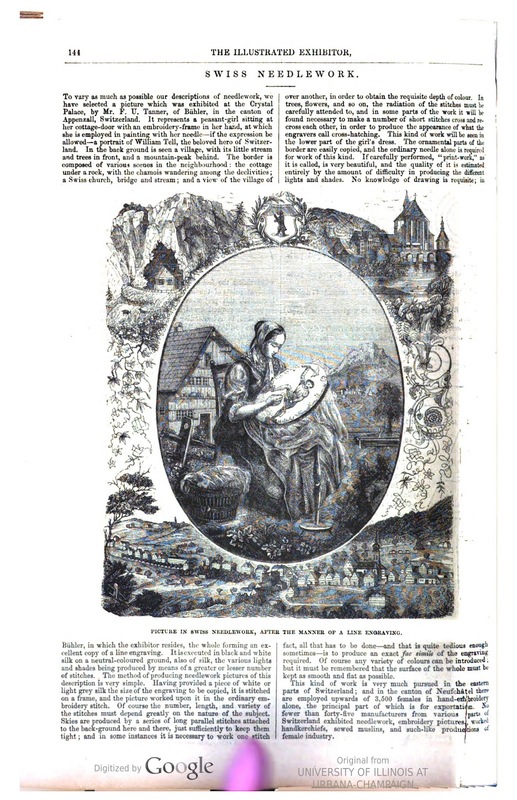 It then experienced a great revival after the The Great Exposition of London in 1851 where a masterpiece of the technique which featured a young girl embroidering surrounded by the alpine countryside was exhibited by the Swiss embroiderer J.U. Tanner. Great pains were taken to precisely imitate the marks of the engraver and in order to reproduce the effect of the prints, the embroidery was executed in silk thread in either black or tones of seppia brown. 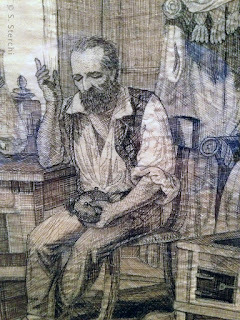 In some cases the work was realized entirely with stitches while in others the background was given washes of colour in order to produce tones similar to the original etching and to avoid endless detailed stitching to obtain a three-dimensional effect. Catalogues of Italian expositions of the period attest to many prizes being awarded for excellence in this technique as we can deduce from this quote: "...printwork embroidery in silk (awarded) for accuracy and fineness of work and for the well-understood application of shading". 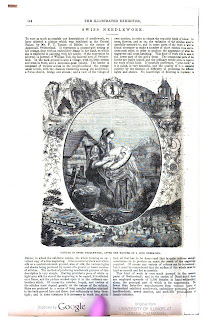 (Provincial Exposition of Industry and Agriculture held in Parma, 1871.) In that catalogue there are a dozen prizes which were awarded to this technique alone. The photos are of a piece that was found at an antiques shop in Crystal River, Florida in the U.S. about 20 years ago. 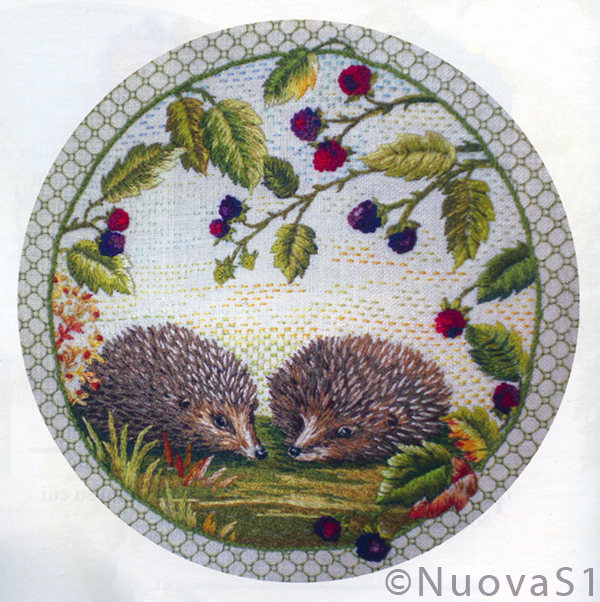 It is a work that is executed with great skill by an embroiderer whose name we know: Luigia Muzio. Dimensions of the piece are 18cm x 12cm and everything is stitched except the date which is printed in ink with a stain around it. After it was purchased, it was reframed using archival materials to ensure it's protection. The ground fabric is silk while the thread is difficult to determine whether it is very fine silk or hair. The embroidery is in good condition with the exception of a bit of deterioration at the top corners. 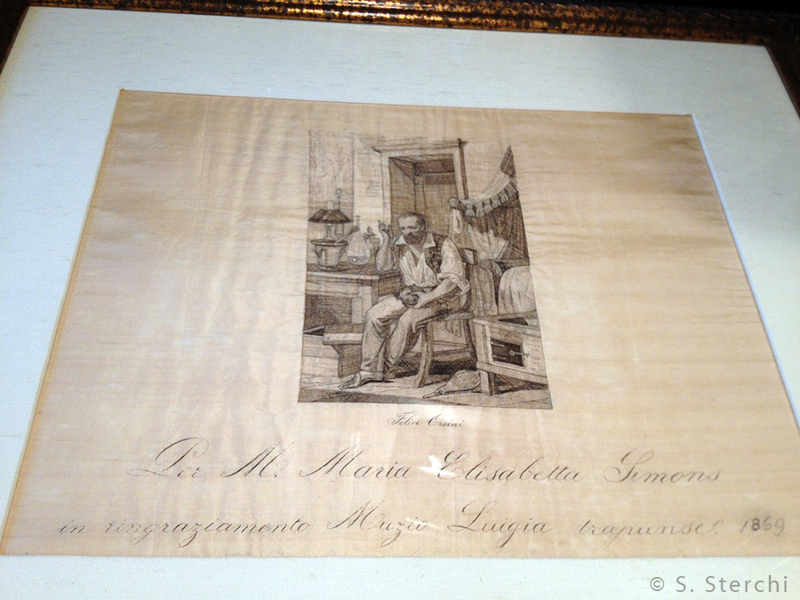 The dedication reads: "For M. Maria Elisabetta Simons in thanks Muzio Luigia stitched 1869". 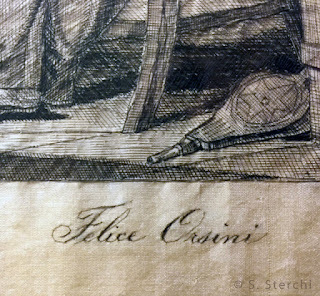 Depicted is Felice Orsini (1819-1858) an Italian patriot who became famous for his attempt to assassinate Napoleon III on the 14th of January 1858 and for which he was later guillotined in Paris that same year. 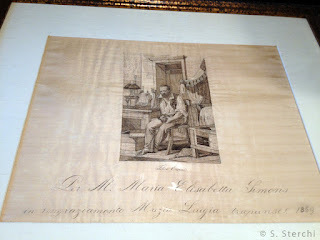 The original artwork print is signed Masutti (which could be the artist Antonio Masutti, 1813-1895) and today is part of the collection of the Risorgimento Museum in Turin, Italy. The embroidered copy meanwhile, can be found with the American lady who found it at her home in North Carolina. It is unknown if the embroidery was executed in Italy or in America. Thank so much to Susan for permission to use her photos and for the wonderful adventure of investigating this interesting piece! When I think of Needlepainting embroidery I usually think of the Long and Short Stitch. There are many talented embroiderers around the world who make the most beautiful pictures with this stitch. 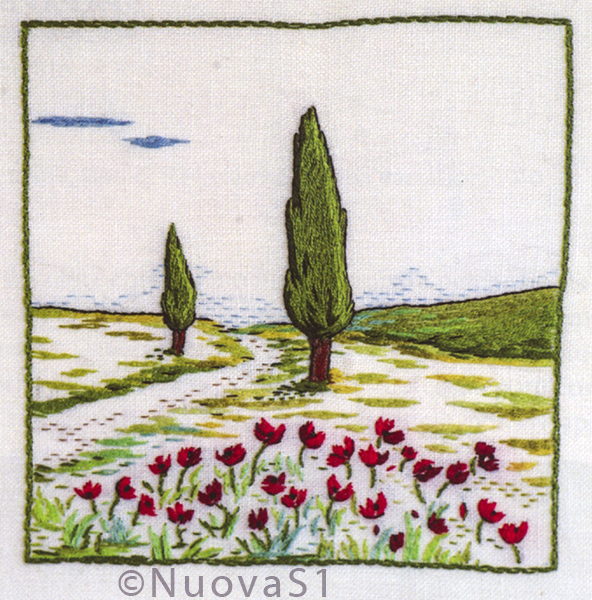 When I was first translating Italian needlework terminology, I came across Punto Risparmiato which is the Split Stitch and I noticed that traditionally and historically it seemed a lot more prevalent in Italian needlework than in North American embroidery for example. I mistakenly thought that it was old-fashioned or perhaps little used today versus during our mother's and grandmother's days. As I was searching out typically Italian needlework techniques, I basically ignored and/or discounted this stitch as not very interesting. Boy was I wrong. Now, I don't know about other countries or even much about North America but the Italians have done some breathtaking things with Punto Risparmiato and since that is what we concern ourselves with here at Italian Needlework, let's talk a bit about that. 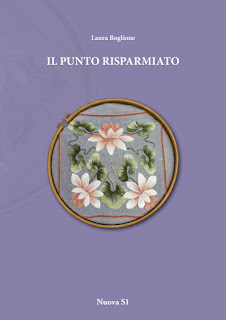 Punto Risparmiato is the Split Stitch as I mentioned above, but "risparmiare" is the verb "to save" as in "to economize on". If you look at the back of the work, you can see that there is not as much thread coverage on the back as there is in say, Long and Short Stitch or Satin Stitch or even Straight Stitch embroidery. Threads are expensive, especially silk threads so it makes sense to use Punto Risparmiato when creating a Needlepainting picture. Laura Boglione of Il Club del Ricamo e Arti Femminili di Grosseto in Tuscany has recently published a didactic manual packed full of tips and advice for using Il Punto Risparmiato. This little manual is 63 pages and has more than a dozen designs for projects as well as step-by-step big colour photos and explanations for a few other complimentary stitches to use alongside Punto Risparmiato. One of the projects from Il Punto Risparmiato by Laura Boglione. Clicking on the photo of the book cover will take you to where you can see a preview of a few of the book's pages. One of four vignettes of the Tuscan countryside from the book. I had never considered Split Stitch for Needlepainting before and it's got me thinking that maybe it's something that I could do as my own experiments with Long and Short Stitch have been a little haphazard to say the least. I think with Punto Risparmiato being a little more regulated, I would feel more comfortable and less afraid. In the introduction of the book Signora Boglione says that the stitch is quickly learned and there are very few "rules" for execution. A versatile and manageable stitch that can be used on many kinds of fabric. It is a perfect stitch for allowing freedom when executing it, thus leaving the designs open to each embroiderer's own creativity and taste. This book is available direct from the Italian publisher NuovaS1, they take PayPal or you can get it from Lacis in the U.S. Text in Italian.